Patty Somlo was raised by a military officer father who was usually absent, both physically and mentally from her life, and a mother who suffered from depression and alcoholism. Their life in the military involved moving constantly. This made it harder to create and maintain close friendships. As a result, this left her with a lot of time by herself. 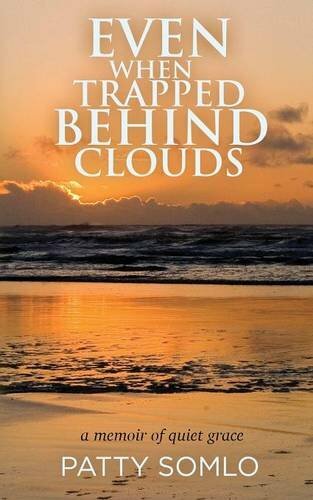 As Patty writes her memoir, “Even When Trapped Behind Clouds,” she takes us on a journey through different memories. In each poignant moment, she includes a lot of detail about the natural beauty of the places where she had her most memorable experiences whether they be good or bad. Her best childhood memories involve living in Hawaii. From there, she moved to the east coast and then even over to Europe. As an adult, she ended up spending a lot of time in northern California and further up in the Northwest. Even while living in the city of San Francisco, she often reflects upon the beautiful experiences she had while hiking. As she writes, it is obvious that there was a lot of sadness and pain in her soul because she did not have healthy, whole parents. Even after they divorced, things did not improve. This had an impact on her personal relationships. When Patty went into therapy, her eyes were opened as to why she was attracting the wrong type of man for herself. After healing occurred, she was able to meet and marry a wonderful man. In spite of being in a close relationship, Patty reflects upon why she still keeps herself in a place where she can easily pick up and leave. At least this time when she does leave, she is accompanied by a partner who shares her love of nature. Depression and anxiety also had a huge impact on her life. Spending several years in therapy helped open her eyes to why things were the way they were. Having a great therapist played a big role in her being able to heal, but so did the love of her husband. He even played a huge part in getting her to work through her anxiety of driving. His love has given Patty a fulfilling, meaningful life. While reading “Even When Trapped Behind Clouds” by Patty Somlo, I found myself reflecting on my own life and my need to keep myself fairly mobile. For example, I have a six-figure income yet I sleep on an air mattress. It is a really good one, but it is still something that is easy to fold up and pack! Patty’s reflection gave me a great deal of insight into my own quirks and I am pleased to have gained some insight on why I might be the way that I am. In my heart, I am still looking for that special place that I can call home.